Thread: February 8th-9th, 2019 - Our SPECIAL "NEHAN-E" ZAZENKAI! WELCOME to our Memorial & Celebration of NEHAN-E, (Pari-Nirvana) the traditional day to mark the historical Buddha's death and passing from this visible world. This is also a day for each of us to remember in our homes those family and friends who have gone before. As well, we particularly mark the passing of Nishijima Gudo Wafu (who passed on January 28th, 2014, just 5 years ago) and Rempo Niwa Zenji (who passed September 7th, 1993). This year, I will also be remembering two teachers who were mentors in Japan and great influences on Treeleaf, Jiho Sargent Roshi and Azumo Ikuo Roshi. During this Zazenkai, we will commence with SPECIAL CHANTS & a CEREMONY to recall our parents, grand-parents, siblings, our relatives near and distant, all our ancestors reaching back through the generations, and our dear friends and other cherished ones who have passed. To mark this time, our Ceremony at the start of the Zazenkai will include a chanting of “The Verse of Homage to Buddha's Relics, Shariraimon” and Heart Sutra in Chinese-Japanese (to mark our "roots"). Words and details are HERE, please print out if you wish. 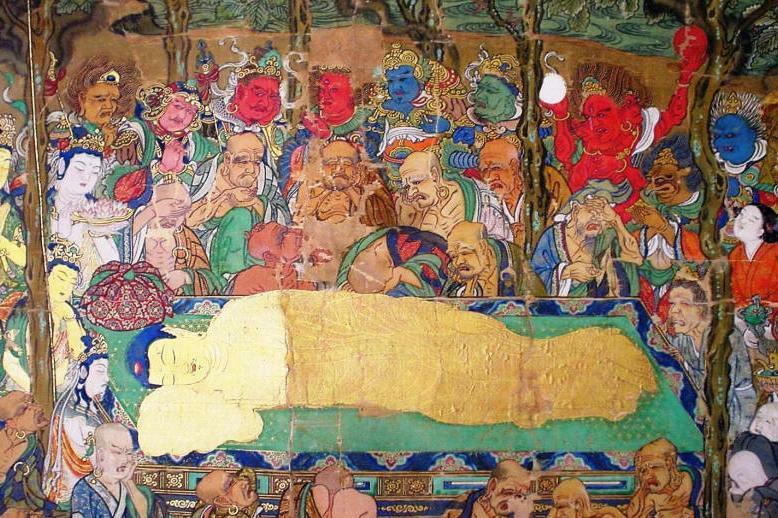 For this special Zazenkai, a statue of the reclining ‘Buddha Entering Parinirvana’, and a Plaque dedicated to all past Generations of Zen Ancestors, will be given special prominence. As always, we close with the 'Metta Chant', followed at the end with the 'Verse of Atonement' and 'The Four Vows'. I STRONGLY SUGGEST THAT YOU POSITION YOUR ZAFU ON THE FLOOR IN A PLACE WHERE YOU ARE NOT STARING DIRECTLY AT THE COMPUTER SCREEN, BUT CAN GLANCE OVER AND SEE THE SCREEN WHEN NECESSARY. YOUR ZAFU SHOULD ALSO BE IN A POSITION WHERE YOU CAN SEE THE COMPUTER SCREEN WHILE STANDING IN FRONT OF THE ZAFU FOR THE CEREMONIES, AND HAVE ROOM FOR BOWING AND KINHIN. ALSO, REMEMBER TO SET YOUR COMPUTER (& SCREEN SAVER) SO THAT IT DOES NOT SHUT OFF DURING THE ZAZENKAI. I hope you will join us ... an open Zafu is waiting. When we drop all thought of 'here' 'there' 'now' 'then' ... we are sitting all together! Last edited by Jundo; 02-09-2019 at 01:41 PM. Today we also recall two mentors in Japan, great influences on Treeleaf, Jiho Sargent Roshi and Azumo Ikuo Roshi. Rev. Jiho Sargent was a Soto priest, a friend, guide, mother and tough as nails voice of reason and common sense in my life for many years. I believe that I first sat with her in 1989 at the temple in Tokyo were she was a priest (Taisoji). She became a priest late in life, at age 49, and was also one of the few Westerners to be trained in a fully Japanese way exclusively in Japan (at the Soto school's special monasteries for women) and then served as an ordinary "parish priest" at Taisoji involved in the more mundane, "day-to-day" duties of a Zen priest in Japan ... a very unusual path for most foreign teachers. She passed 10 years ago this upcoming June. Azuma Roshi (東郁雄老師) shared tea with me, practicing his English and answering my silly questions, for most of 10 years when I sat with the weekly lay Zazenkai at Sojiji Honzan in Japan. He was a great Dogen scholar, lecturing us each week on Shobogenzo (that is what he is lecturing on in the picture above), and instructor of hundreds of young monks as well as the lay persons' group there (including quite a number of foreigners who would wander in). I may not have stayed with this practice without him. He was always so kind, down to earth.When I came here 20 years ago, my Japanese was pretty bad the first few years, and he lectured in Japanese ... but always took time to summarize in broken English so I would get the gist. Later, he returned to his temple of Jikouji in Kyushu. He left this visible world 8 years ago this month. Their pictures will be kept next to a statue of Kannon Bodhisattva in our Zendo. Last edited by Jundo; 02-08-2019 at 01:02 PM. I will likely be time shifting but I will be there none the less. Thank you for sharing about your mentors. I'll be remembering my Dad. The wisest man I have ever known. Oh it's wonderful to be able to sit this one-way with you tonight, I had to miss it the past 2 years. The 13th anniversary of my Mom's passing was a couple days ago. One of the biggest and most unexpected gifts of this practice has been that I almost feel like it gave her back to me, or at least helped me realize that she never left. Sitting with you all live one-way. Had to leave a bit early, but thank you so much, Jundo, Shingen and everyone. Our ancestors, loved ones, teachers, are all here with us. Apologizes for my crackly voice ... it really touched me today and was fighting back some tears, but lovely either way. Deep bows to all beings. Thank you, everyone. It was a lovely service and zazenkai. Have a great weekend! Thank you Jundo and everyone. I will be sitting with the recording tomorrow morning. I will be remembering Michael Hiyashi Sensei (My first teacher) as well as many family members. “i cry in my dream”. very beautiful, it embraces our humanity. That was lovely. I enjoyed seeing the snow in your yard, Jundo! Thank you for including the absent love ones! With the help of my wife (who is not religious) I had set up the altar for the Nehan-e, which I did on Saturday morning (German time ... but it really felt like sitting together with you). When I was ready to start the Youtube vid, I found the e-mail from Jundo, telling me that I was registered at Treeleaf. So actually my start as an active member of Treeleaf coincided with commemorating our departed. Truly a special sitting for me. I specially liked the part of "Grieving in the dream". I used to admonish myself for feeling the pain of grief, telling myself that as a Buddhist I should be beyond grieving ... it was really an eye opener to me, when Jundo spoke about Azuma Rôshi's grief. That was an amazing ceremony. Thank you Jundo and Treeleaf for this.